Enjoy Life Foods - Here's a yummy-in-your-tummy treat for celebrations. 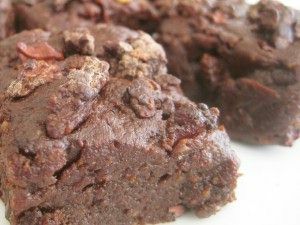 It's allergy-friendly (no wheat, dairy, peanuts, tree nuts, egg, or soy), gluten-free and super easy to make. Everyone is bound to enjoy! In fact, it's a great treat for any occasion! Combine cocoa powder, Sunbutter and brown rice syrup in a large bowl. Stir in chopped sunflower seeds. Mix well and set aside. Combine chocolate chips and canola oil in a microwave safe bowl. Heat 30 seconds, stir. Continue until all the chocolate is melted and smooth. Add vanilla to melted chocolate and stir. Add melted chocolate to remaining ingredients. Mix until dough pulls away from the bowl and forms a ball. Pour mixture into 8-9″ round pan, smooth out and chill for 15-20 minutes. Then share with friends and family, and enjoy! If not allergic to peanuts and / or tree nuts, feel free to sub in your favorite nut butter.